For a better experience on Ocean Frontiers, Update Your Browser. Snorkel an undisclosed location with your guide to navigate point-to-point along the East End Barrier Reef for a one-of-a-kind experience. Float continuously over a 1,000 meter stretch of untouched coral reefs. 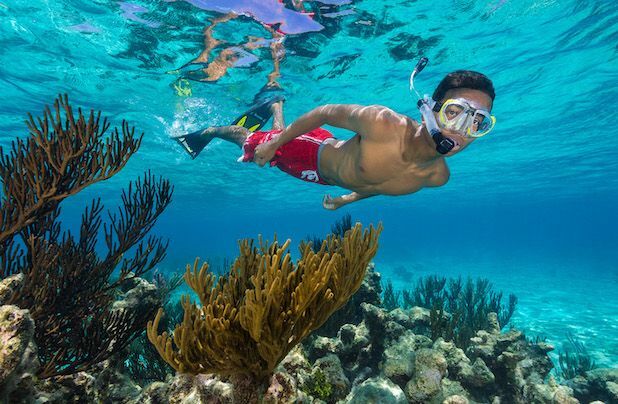 Snorkel in one direction, Point-to-Point, drop off at one end of the reef and pick up at another. Expert Snorkel Guide, Towel, Drinking Water, Mask, Fins and Snorkel. Click play, sit back, relax and enjoy a glimpse of what diving in the Cayman Islands with Ocean Frontiers looks like. Copyright © 2019 Ocean Frontiers ltd. All Rights Reserved.